Me and Nan, originally uploaded by Lukasmummy. Credits: Layered template (Journal Me Template Bundle, Template 2) by Scrappin Addict/Scrap-a-holic Designs and Morning Bloom Collab by Jewel Goodwin (Mad Genius Designs) and Vicki Eggins (Dana’s Footprint Designs). Font is Pea Chris In A Hurry by Amanda Bottoms (Fonts For Peas). Journalling reads: Some people say a picture is worth a thousand words, but you don’t always need that many to tell the story behind the photograph. I know absolutely nothing about this photograph of me and Nan. I can guess at a few of the details though. I can guess that I was about 2/3 years old when it was taken. There are a lot of photos of me in similar style dresses. Nan looks so young in this picture, it’s difficult to remembr her ever not looking more like the Nan we are used to. From the fact that it’s on a balcony and I know we spent a lot of time living in Gibraltar when I was little, I can assume it was taken there. But one thing I don’t have to assume is the love there was between me and Nan. It’s obvious from the tender way she is holding me and the fact that I look content. I remember spending so much time in that same position even once I really got too big for her lap. I remember that when we finally outgrew cuddles like that I used to be allowed to sit on the arm of her chair next to her instead. We both got older, lots of things changed but we still love each other just as much, are still willing to do anything for each other. So maybe when it comes to some pictures they don’t need a thousand words, just three really simple and straight to the point ones like, I Love You. 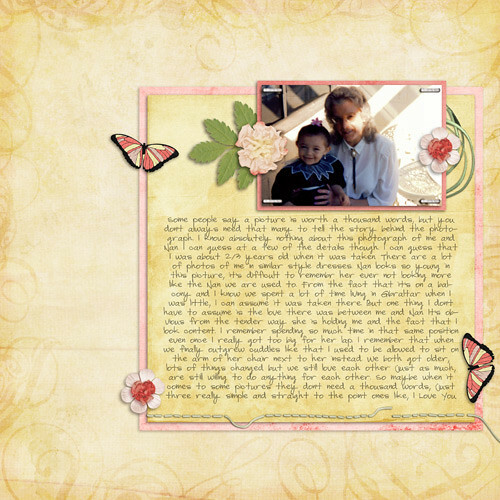 Enabling: Journal Me Templates by Scrappin Addict/Scrap-a-holic Designs available here and Morning Bloom Collab by Mad Genius Designs and Dana’s Footprint Designs available here and Pea Chris In A Hurry is available here. 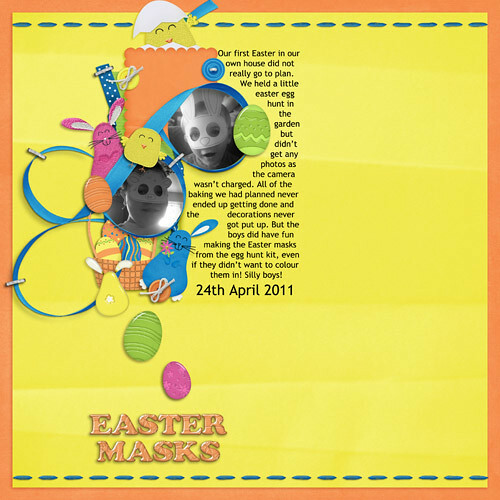 Easter Masks, originally uploaded by Lukasmummy. Credits: Layered template (May 2011, Template Challenge) by Scrappin Addict Designs and EggTastic Bundle by Jewel Goodwin (Mad Genius Designs) and Designs By Tracy. Font is Trebuchet MS. Egg Hunt, originally uploaded by Lukasmummy. Credits: Layered template (Adventure 365, Template 11) by Jewel Goodwin (Mad Genius Designs) and EggTastic by Jewel Goodwin (Mad Genius Designs) and Designs By Tracy. Font is Letter Gothic Std. 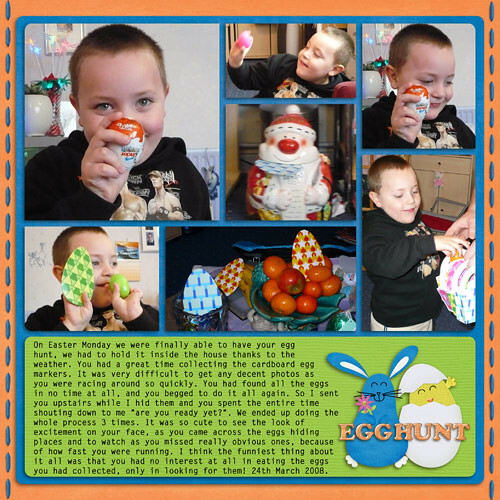 Journalling reads: On Easter Monday we were finally able to have your egg hunt, we had to hold it inside the house thanks to the weather. You had a great time collecting the cardboard egg markers. It was very difficult to get any decent photos as you were racing around so quickly. You had found all the eggs in no time at all, and you begged to do it all again. So I sent you upstairs while I hid them and you spent the entire time shouting down to me “are you ready yet?”. We ended up doing the whole process 3 times. It was so cute to see the look of excitement on your face, as you came across the eggs hiding places and to watch as you missed really obvious ones, because of how fast you were running. I think the funniest thing about it all was that you had no interest at all in eating the eggs you had collected, only in looking for them! 24th March 2008.